Let’s get right to the point: we want to be your guitar repair shop. Finding a great luthier is not unlike finding a great mechanic. It’s a relationship built on trust and communication. 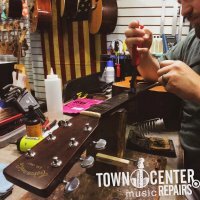 Town Center Music maintains a “holistic repair” perspective: each instrument is as individual as it’s player, and an adjustment made in one area means adjustments will have to be made elsewhere. We love to take time with you to figure out the best setup for you. 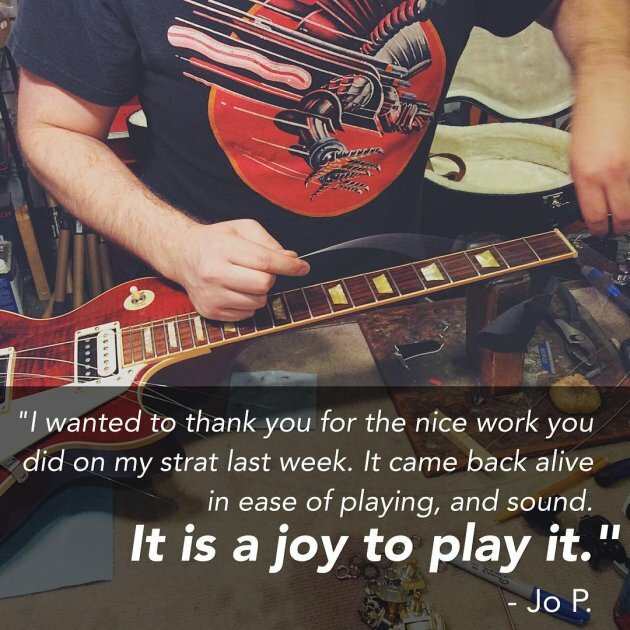 We’ll take notes on your playing style and apply them to our systematic approach to repair to ensure you get consistent results every time you pick up your instrument from us. One thing that separates TCM Repairs from the rest of the pack is our huge selection of available parts. We stock high-quality components from some of the best brands in the industry: Emerson Custom, GraphTech, AllParts, CTS, Schaller, TonePros, Porter Pickups, Seymour Duncan, TV Jones, the list goes on and on. Pay us a visit and compare our selection to others – we’re sure you’ll agree that no one has a better selection on-hand than TCM Repairs. A setup is one of (if not the most) important services you can have done to your guitar and should be performed at regular intervals. The wood your guitar is made of is the source of its tone but is also the biggest source of movement when temperature & humidity make drastic shifts. TCM’s luthiers will adjust necks & bodies to correct these shifts and get your instrument back to spec. 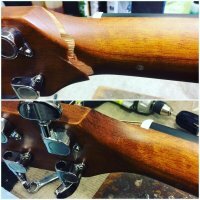 We also adjust nut slots to the correct width & depth, adjust saddles & slots, tighten tuning keys, oil fingerboards, polish frets, correct intonation, and clean pots & jacks. Love your guitar but don't use the tremolo? A setup is the perfect time to have it blocked for richer tone & sustain. You’ll be amazed at how much fun to play your guitar will become after a signature TCM setup. Is your guitar chording out of tune, even when your open strings are pitch-perfect? Or are you seeing those dreaded divots on the frets, just under the strings? Friend, you might just need some fretwork. The fretboard is one of the most crucial components to the playability of your guitar and repairing/replacing the frets happens to be a complicated and detail-oriented project that should not be left to just anyone. Fortunately, TCM’s luthiers have decades of combined experience with acoustic & electric guitar fret jobs, and you’ll not find a cleaner fret end or smother polish. Schedule a free consultation and find out if your guitar can be improved with either a fret dress or complete refret. A fret dress (or level & crown) is the answer for frets that show signs of wear (those divots that happen under the strings, especially between the 3rd and 5th frets), but have enough remaining height to be leveled out and re-crowned (the process of returning a smooth arc to the top of the fret). A full refret is needed when those divots get too deep, and a fret dress isn’t possible. 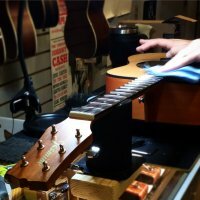 We remove the frets, plane the fretboard, replace the frets (plus a bunch of other steps), and then clean up the fret ends to make them smooth & give them that coveted “broken-in” feel. 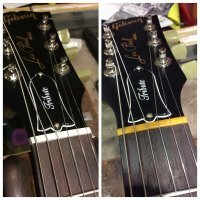 This will give your guitar a new lease on life with some brand-new shiny frets. Another big bonus to a refret: this is a great chance to change fret size, giving you a more comfortable & easier playing experience. Schedule a consultation today. On a guitar, the nut and saddle can add a tonal richness & complexity, or they can choke the life out of your strings. Bone is the traditional material of choice for both nuts & saddles, and will give your tone a classic resonance, sustain & sparkle. In recent years, a company called GraphTech has developed & refined a line of self-lubricating components to help keep your guitar in tune, no matter how hard you bend or strum. Both materials are lightyears ahead of a plastic drop-in component, which may seem to fit the neck of your guitar, but have incorrect slotting width & depth, which will adversely affect both tone & playability. TCM’s luthiers can review the options with you to determine which meets you needs best. Both acoustic & electric guitars can benefit from these upgrades, and we guarantee you’ll hear a difference. 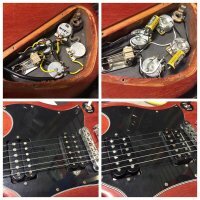 Guitar pickup installation can be deceptively trick, and with an electric guitar, half of the tone is in the electronic signal path. 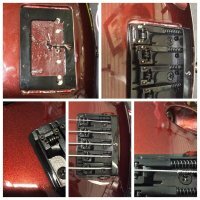 Every component matters, from the pickups to the output jack, and a single cold solder joint can cause all kinds of tonal havoc. Good news: TCM knows electronics. 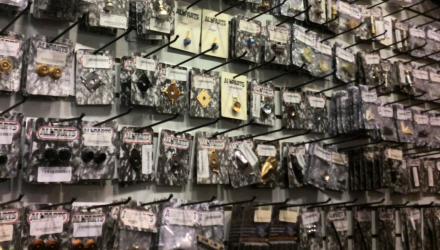 We stock high-quality electronic components from brands like Emerson Custom, Switchcraft, Porter Pickups, TV Jones, and many more to ensure your guitar’s tone rings loud and clear. Have you dreamed up a complicated switching system, with options for coil taps and phase adjustments? We can do that, too. Whether you’re looking to replace a single component or perform a complete rewire, TCM has the knowledge and experience you can count on to make your guitar sound great. It’s an old cliché: accidents happen. But clichés are clichés because they’re true. A trip, a drop, unchecked heat & humidity shifts, all of these can result in structural damage to your instrument. Beyond the tonal issues, structural damages can shorten the lifespan of your guitar. That’s why TCM pays special attention to detail in returning your instrument to its’ former glory. Using techniques & materials refined over decades of combined experience, TCM’s luthiers will bring your baby back to life. A cracked top, broken neck, or lifted bridge can seem like the end of the world but fear not - as soon as the accident happens, we’ll be ready. Hot rods and guitars: not just a match made in heaven, but lots of commonalties, as well. Both make a big noise, and both can be souped up and customized to your personal specifications. We carry electric guitar pickups from some of the bends brands in the industry: Porter, Seymour Duncan, TV Jones, DiMarzio, to name a few. The same for acoustic guitar pickups: LR Baggs and K&K Pickups have pushed the bounds of acoustic amplification, and TCM is proud to carry and install both. Beyond pickups, tuning keys, bridge saddles, switching, almost every component can be upgraded, and we can do it all. TonePros aftermarket hardware upgrades will bring your tone to life. Bring us your modestly-priced guitar and let us show you what kind of tone is possible. Or, bring us your fretted work of art, and let us tailor the tone to your specs. Only place I'll ever go to get my guitars set up and repaired. These guys go above and beyond when it comes to customer service. One of the best setups I've ever felt. Made my Tele feel brand new! It makes me excited to play guitar again. Super competitive pricing, awesome dudes, great service, quick turnaround. I have had several guitars repaired here and the workmanship was excellent. This is now the only local music store I will support with my business. A very friendly group of people that are knowledgeable and helpful. This is the best place in the area to get set-ups and work done. Search Instagram for #TCMRepairs to find some examples of our past work.